Boeing is attempting to market their new plane the 7E7 to passengers hoping their interest will pass through to airlines who will purchase the planes. This sounds like the strategy that has worked for pharmaceutical companies. Sell the consumer and get them requesting the drugs by name from their doctors. While there is some precedent for this in the airplane business there is also some debate about the effectiveness of this strategy. Personally, I think it's a good idea to reach out and engage customers directly. The days when plane manufacturers and airlines can simply dictate plane specs based on pure economics are gone. Today it's all about differentiation. Pick the feature or features that you like and fly the airline that does the best job providing those features. I myself like to fly American Airlines because they have the best legroom of the majors. To me it's worth a few or a lot(depending on flight length) of extra bucks to fly American just for the legroom. Marketing airplane features directly to passengers makes a lot of sense in a time when entire airlines are picking a single plane model for their entire fleet. 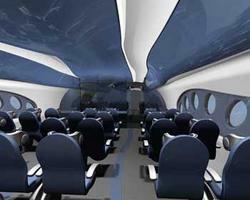 Will the next discount carrier startup build a fleet with the 7E7 based on it's passenger amenities? I wouldn't be surprised. JetGreen anyone?